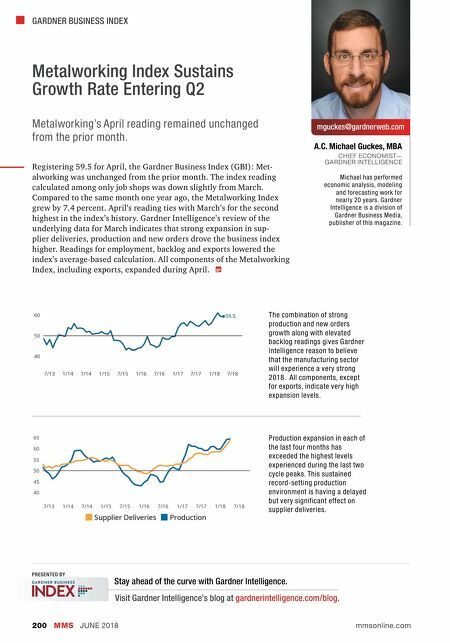 GARDNER BUSINESS INDEX MMS JUNE 2018 200 mmsonline.com A.C. Michael Guckes, MBA CHIEF ECONOMIST— GARDNER INTELLIGENCE mguckes@gardnerweb.com Metalworking Index Sustains Growth Rate Entering Q2 Metalworking's April reading remained unchanged from the prior month. Michael has performed economic analysis, modeling and forecasting work for nearly 20 years. Gardner Intelligence is a division of Gardner Business Media, publisher of this magazine. Registering 59.5 for April, the Gardner Business Index (GBI): Met- alworking was unchanged from the prior month. The index reading calculated among only job shops was down slightly from March. 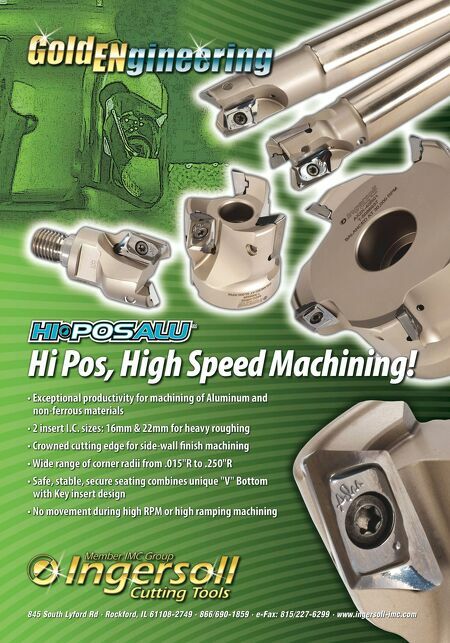 Compared to the same month one year ago, the Metalworking Index grew by 7.4 percent. April's reading ties with March's for the second highest in the index's history. Gardner Intelligence's review of the underlying data for March indicates that strong expansion in sup- plier deliveries, production and new orders drove the business index higher. Readings for employment, backlog and exports lowered the index's average-based calculation. All components of the Metalworking Index, including exports, expanded during April. The combination of strong production and new orders growth along with elevated backlog readings gives Gardner Intelligence reason to believe that the manufacturing sector will experience a very strong 2018. All components, except for exports, indicate very high expansion levels. Production expansion in each of the last four months has exceeded the highest levels experienced during the last two cycle peaks. This sustained record-setting production environment is having a delayed but very significant effect on supplier deliveries. PRESENTED BY Stay ahead of the curve with Gardner Intelligence. Visit Gardner Intelligence's blog at gardnerintelligence.com/blog .